The warm roasted squash just nestled so nicely with the cool baby spinach leaves and the crisp chunks of apple in this fall salad. The feta cheese melts just enough to add a creamy tartness to the bed of greens, all topped with a sweetly sour lemon dressing. And the sprinkling of nuts was the crunch that added one more dimension to this fall salad I made. It's pretty easy to see I really loved this salad. I’ve been inspired lately by a new cookbook, “Raising the Salad Bar,” by Catherine Walthers, to really think about, even plan -- a novel concept! – what’s going into a salad, what greens, what combinations of fruit or vegetables, instead of my usual habit of going to the fridge and just randomly gathering what’s there for a lunch. Half a pepper, a cuke, couple mushrooms, a carrot. Pretty boring. I was beginning to approach salads the same way I often do soups -- just chop this leftover and that and add broth or cream, some extra seasonings and have some kind of soup. And making the salad dressing, instead of just grabbing a bottle – my husband still loves and always will love his ranch dressing! – was also worth the tiny bit of extra time it took. Every time I make a dressing I tell myself I should do this more often. Usually, I just resort, a good resort, to sprinkling balsamic vinegar on any of my humble “whatever’s there” salads. Actually, it was the squash from neighbor Dude and the bumper crop of our own apples that also helped with this salad. But I think I’ll be planning to make this one again. I might even get my husband to try my lemon dressing instead of ranch! 1. To roast squash: Preheat oven to 400 degrees Fahrenheit. Cut the squash in half lengthwise and scoop out the seeds. Then – using your best knife! – cut the peel away from the squash flesh and cut into ½ inch cubes. Toss the cubes with the olive oil and salt in a bowl, spread on a rimmed cookie sheet and roast for 25 to 30 minutes, stirring the cubes halfway through. 2. Cut the apple into cubes and toss with the 1 teaspoon lemon juice. 3. Make the dressing: Combine all the dressing ingredients in a blender or food processor and combine well. 4. 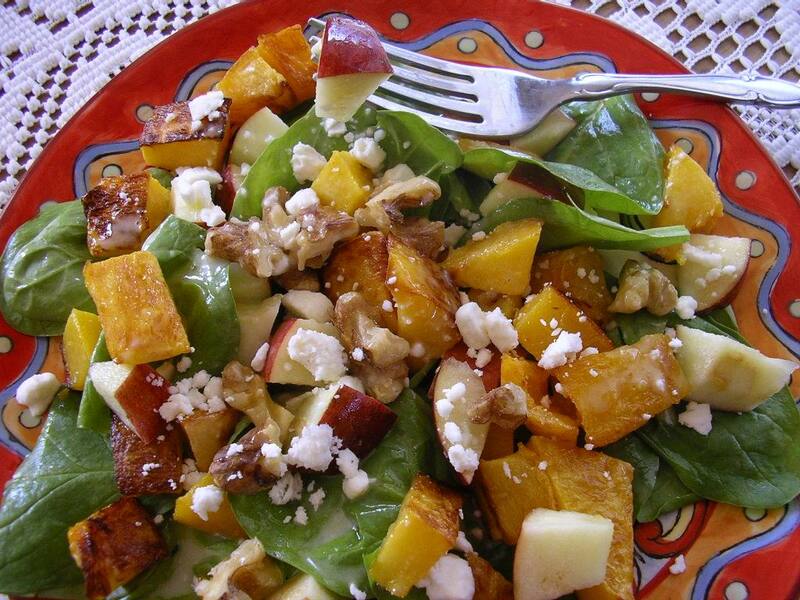 Combine the roasted squash cubes, spinach, apple and walnuts in a bowl and toss with dressing to coat. Sprinkle the feta cheese on top and serve. Makes 4 servings. This fall salad looks yummy and very healthy too... Thanks for sharing! Love this combination for a fall salad. It's still nice enough out that you may even be able to grow your own greens, still (depending on your area). Nancy -- When it looks good and is healthy, that's a plus, isn't it? Diana -- If only my husband hadn't mowed the garden,there just might have been some spinach and it really would have been a harvest salad! The way you described this salad in the first paragraph had me drooling! I can only imagine how great that roasted squash tasted with the salty cheese and the crunch from the fruit. Thank you for sharing. I hope your weekend is going well! I guess you could tell I really loved it, Monet! So beautiful and appetizing! Love the flavors! I love this salad, roasted squash paired with the creamy lemon dressing.. This looks so amazing!! My Mom absolutely adores salads and is always looking for new recipes for them. I love salads too so I can't wait to show her this one. Thank you SO much for taking the time to link it up to Foodie Friday!! Rosemary this looks DIVINE!!! Thanks for linking up and tweeting too! You rock!